This week I took our students once again to the Serbian Royal Palace to take part in the Crown Princess Catherine’s “Children Helping Children” Christmas Gift Drive. The Serbian Royal Family, although they are not officially part of the Serbian government, do live at the palace and serve as goodwill ambassadors of Serbia to the world. They also do a lot of charity work. We were given a tour of the palace and got to meet both the Crown Prince Alexander II and their grandson. This was my second tour of the palace as I went and saw it last spring. 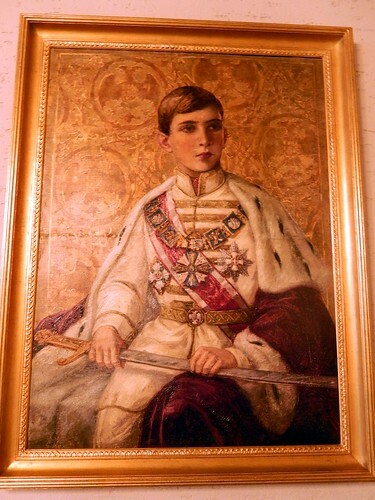 One of the interesting stories of the tour was this portrait of the last king of Yugoslavia, King Peter Karađorđević. The painting was from 1934, shortly after Peter took over from his father, Alexander I following his assassination in Marseille during a state visit. It must have been quite a shock for him to lose his father and become king. Because of being so young, he didn’t take over and his older cousin ran the country. He finally took over from his cousin in a coup de ‘etat in 1941, but fled when the Nazis occupied Belgrade. He ended up living in the USA for many years and died in 1970. He was finally repatriated to Serbia this year, with his remains being buried in Oplenac last May. The painting was found in a shop in Paris years after WWII, as it was part of the works of art that were looted by the Nazis from the palace during the occupation. Below is a video of the opening of the Crown Prince Alexander’s II speech to us. He is the son of Peter II. I am fundamentally opposed to monarchies and the idea that a family should be treated better than anyone else. It is ridiculous if you consider in today’s world, we still have kings and queens. It is a big waste of tax money! I guess if the monarchy brings in tourist dollars like England, or can somehow pay for itself, then I can tolerate them. Is the Serbian Royal Family worth it? Does the charity work they do and the good will they bring towards Serbia worth the upkeep of the palace? I don’t know enough about their finances. The palace and grounds are beautiful and it does make a nice afternoon for tourists. There is a lot of history in the place and Serbians should be proud. I would feel better about royalty if instead of being hereditary, the king could be selected by a panel of experts of someone worthy of the position and who would do a good job of promoting Serbian and helping the disadvantaged of the nation. Usually in families it is hit or miss with each generation. I also wonder what the future holds for the Karadjordjevic family. What will they be like in 50-100 years?